Summer is finally making an appearance in this mossy little seaside town. It makes it all the more satisfying to be able to pull the first vegetables from the garden. 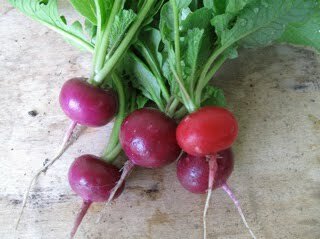 And some, like these radishes, are put into the visual inspiration file. Their roundish, squat shape and their color variation — along with their long and crooked root — make me want to draw and play with paint and color, to top off red with green: which are, consistently, my two favorite colors together.